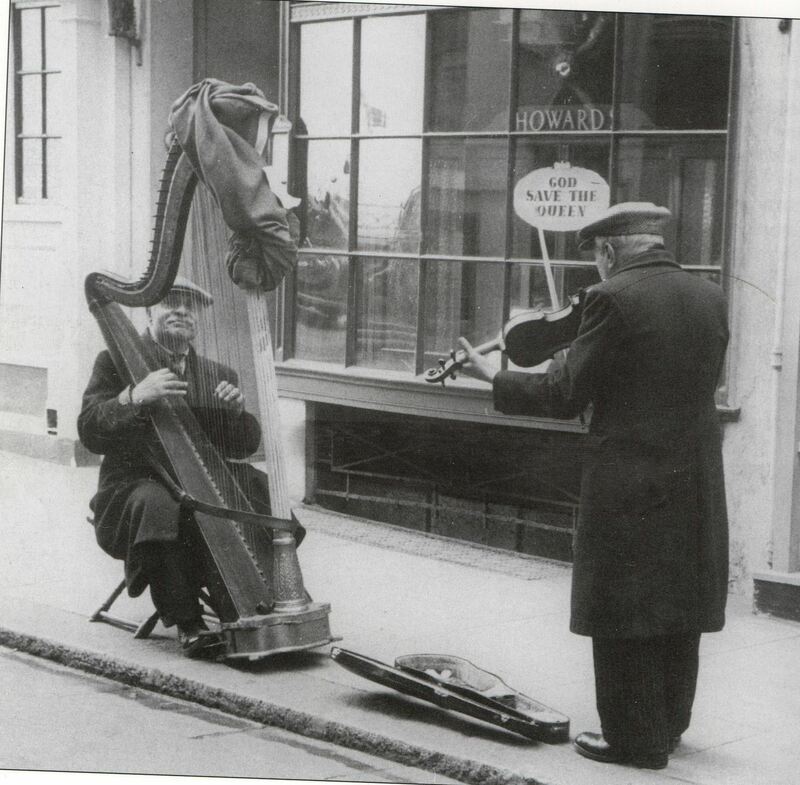 This photograph shows my old neighbour Frederick Alexander who used to play his harp outside Hanningtons in North Street, and also in the East Street area during the 1950s and early 1960s. The violinist was Joseph Marcantonio, who died before we moved to Twineham Road in Whitehawk, therefore I never knew him. We lived at number 5 Twineham Road, and Mr Alexander (as we knew him) lived at number 3. I believe Frederick’s harp is still owned by one of his descendants as my sister is still in contact with one of them. This duo was a wonderful feature of the town’s shopping area every day in all weathers throughout the year. As well as Hanningtons and East Street, another spot they chose was in Dyke Road by the end of the Arcade. I remember them in the 1940s and 50s. Eventually Frederick went out on his own after Joseph died. I have no idea how he got his harp to their playing location each day. It would be interesting if Marion could find out. I’ve spoken to my sister and she’s going to contact Frederick’s daughter with your query Pat, even though we lived next door to him I don’t remember how he managed to get his harp from Whitehawk to the centre of the town. Another interesting thing about Frederick was that he used to tap dance and was often heard practicing in his kitchen. Regarding your comments about Frederick Alexander. I am his step grand-daughter and know for a fact that he never lived in Twineham Road, but lived in Queens Park Road. I think you are getting confused with one of his sons uncle Boshie who lived in Twineham Road, and used to tap dance and do routine’s as a black singer. Grandad used to carry his harp to the centre of Brighton on his back, he was very strong and would entertain the family at Christmas with feats of strength like picking chairs up with his teeth and such like. He was a lovely man and loved people. He had five sons and one daughter whom have all passed away. My step dad Augustine the last to go last November aged 95 years. My sister has today managed to speak to the daughter of Maureen’s Uncle Boshie, who my family all understood to be Frederick Alexander. Maureen I am very sorry that we all mistook him for your step grandfather. We were unaware that he wasn’t Frederick until now. Even our late mother talked of Boshie as Frederick she would have been as surprised as we are! Unfortunately my sister wasn’t able to ask Boshie’s daughter, too many questions today as there are health problems with one of her brothers, and her sister has been poorly too. We have very fond memories of our Alexander neighbours, they were well like by everyone who knew them. Boshie did live at 3 Twineham Road, he was married to my sister Eve (nee Hooper) and they lived with their two daughters, Joan and Shirley. At the time the tap dancing that was heard in the house was when my brother Phillip Hooper and myself Olive and Boshie were practising for shows. Boshie used to put us through our routines, what fun we had. Boshie used to stutter and get uptight and tell us off, and the more he did this the more we all laughed (especially if my brother Phil had the wind) that would send Boshie off in a rage, so we had to control the giggles within us, yet it didn’t stop us going on competitions and winning every time. I was about 7 or 8 at that time, Phil would have been about 12, and Boshie would have been in his late 20s. We were called the ‘Three Black Bows’. We used to blacken out our faces with boot polish (spots the next day) and put on all the rough old clothes you could think of, I had a wig with rags in it, and boots 3 sizes too big. Boshie was the main act and we were his side-kicks. He was a fantastic mimic and a very funny man and told wonderful jokes. It would all end up with a dance routine, nothing like he planned, he’d change it all the time and Phil and I had to somehow follow on, despite all our rehersals. Our main competitions were won at Saturday night Sherry’s, but I remember one night we couldn’t go on as we were threatened by a razor gang Good job really because Boshie invariably, after quickly throwing our costumes in a case, forgot his right shoe and only had two left ones, and he had a grandad’s vest instead of his pants and would have had to wear them upside down for the show. They were grand old times that not only bring tears of laughter at all the antics, but tears of sadness to think they’ve gone and all the wonderful characters with them. Boshie was such a handsome man like his father Frederick, very much like Clarke Gable, and both very talented and well loved. Sadly Boshie died in the late 1980s, and my brother Phil died in 2000. If anyone remembers anything about the Alexander or Hooper families, I would love you to post it on this site, as I’m still here and cherish all of these and any of your memories. Looking at the picture takes me back to a young lad in the 50s. I often used to see these two musicians playing in the street. I always felt sorry for them as they were out in all weathers. Unless there was another couple of men also playing the harp and violin, I recall them as well. They used to play just inside Brighton Station opposite the taxi rank and left luggage office in the 50s. By then,one of them was sporting a magnificent white beard. Roy – do you have a relation by the name of Ray Grant? My family and I were great friends with Frederick’s son Levi, and I remember as a boy him always talking about his father playing the harp around Brighton. My Dad did an apprenticeship with an Italian Brighton floorlaying firm. Can’t remember the name of it, but Levi and his brothers Augie , Boshie and Joe all worked for them. I remember Joe had a fishing boat on the seafront and my Dad was often found hanging out there with all the brothers . They were a very close knit family typically Italian and all were proud of their roots. Their real surname was Aliandro. They were great characters, who are very sadly missed by me. Levi was like a second father to me . Levi, Frederick’s son, was also a classy champion amateur boxer and was so proud of his impressive collection of trophies. Some of these he had to fight three times in one night to win. Don’t really know how his family had come to the UK from Italy. My Mum’s family the Pirollis, who owned Pips Ices in Oxford Street are also another mystery to me. Have no ideas as to how they ended up in Brighton . Pip’s ices were the best in town. I went to Fawcett school. We used to skip school dinners, rush over to the east end of Oxford Street (opposite The Level) buy a big bag of stale cakes from the shop on the corner, then down to Pips for an ice cream. as I remember the little old lady was always dressed in a black lacy matierial, we called her Mrs Pip, she was always very nice with a big smile. The pink ones were the best! Don’t you just love this site? It’s brilliant! My Grandad was Lorreto Franchi who had the floorlaying company. My father Dave told me about the two musicians today. My father remembers the harp being stored in the work shop. Hi, my granddad was Charles W Emery and anthough I didn’t know him as I wasn’t born until after he died in 1957, I recently found out he used to be a street musician and used to perform sometimes outside the Whitehawk Inn around 1950s. If anyone knew or used to see him I would be interested in any information please. I remember a John Franchi, he played sax / clarinet. We used to play in a trio together during the mid 50’s. John joined the army as a musician while I joined the RAF. My Grandfather was friends with Augie. I have a picture showing all the guys laying the floor at Woodingdean Primary School. Helen – send me your email and I will scan and send it. I grew up in Brighton in the 40s and 50s, and practically lived in the public library. On my way there after school I would often see Frederick Alexander and Joseph Marcantonio (as I now know them to be) playing outside Hanningtons or Duke Stree post office. It was my first introduction to classical music and it knocked my socks off! I used to stand and gawp in wonder listening to them, entranced by the wonderful sound they made. Sadly I wasn’t allowed music lessons as a child, but as an adult I learnt the cello and now, following humbly in these two great men’s footsteps, I play chamber music in a string quartet. And in my study I have a prominent copy of a photo of my first two heroes which I see every day. Always remembered with joy. Never forgotten. I am not sure if the right people will get this but if they do please get in touch. Two men came into Alfresco and said they were related to one of the musicians from Viggiano. The owner of Alfresco is also from Viggiano. They said they still had the harp. If they are interested in selling it please get in touch as we would love to buy it from you and return it to Viggiano to be displayed in the village museum as a piece of history. It is something they are really interested in. Please email alfrescoevents@Hotmail.co.uk. Yes, Franchi was the name of the firm my Dad did his apprenticeship with, situated left turn up St James’s Street if my memory serves me well. But I remember a small place in east Kemp Town where he often went to pick up materials. They had a workshop situated where the Morrisons / Safeways car park is. Back in the 80s it was purchased from grandad so access was possible to get to the car park from the supermarket.